Set in the heart of the Asian wilderness against the backdrop of beautiful mountains, the new Eastern Emeralds slot features iconic oriental themes including dragons, fish and birds. Unique to this game is a 1680x bet win multiplier, one of the highest available in any online slot. Multiplier wild symbols appear anywhere on the reels and substitute for all symbols, except the bonus scatter symbol. The phoenix rises from the flames when three bonus scatter symbols appear, triggering the Destiny Bonus where you choose their future fortune. Four different free spins options are available, where those with fewer spins carry a higher risk, but equally have the potential for a higher win. Normal Wilds – The wild symbol substitutes for all symbols except the bonus scatter. It appears on only reel 1 of the base game and free spins bonus round. 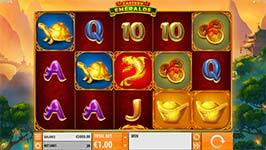 Multiplier Wilds – The rewarding Multiplier Wilds can appear on all 5 reels of the game. These wilds will substitute for all symbols, except the Bonus Scatter symbol. If two or more multiplier wild symbols appear on a winning pay line, then the corresponding multipliers are multiplied. Destiny Bonus – Land three Phoenix bonus scatter symbols anywhere on reels 2, 3 and 4 to trigger this bonus. Select from four different free spins options for the Destiny Bonus. Free Spins options range from 6 free spins with up to a x1680 multiplier to 15 free spins with up to a x120 multiplier.